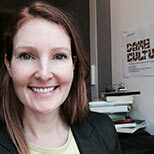 Siobhan Thomas is Course Director of and Senior Lecturer on the BA (Hons) Game Design and Development degree at LSBU. Siobhán is a game designer and writer specialising in augmented reality and pervasive learning games. She has run the BA (Hons) Game Cultures course since 2008. Her academic focus is carnal methodologies for game design and she researches body-oriented game design practices. Siobhán sits on the boards of a number of gaming organisations; notably, Women in Games Jobs and DIGRA UK. Siobhán is one of the International Game Developer Association's (IGDA) London Chapter Coordinators and she co-founded the industry-recognised Enable Gaming project. In her spare time, Siobhan makes videogames for animals. Please email thomass5@lsbu.ac.uk to get in touch.